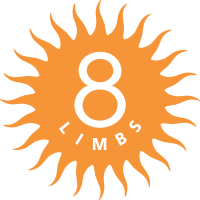 8 Limbs Yoga | Enlighten Up? So we went, we watched, and we pondered. The film “Enlighten Up!”, showing at The Varsity through May 28, is subtitled “A Skeptic’s Journey into the World of Yoga.” Indeed it was. At the May 14th screening, a crowd of 8 Limbs teachers and students gathered to see what a documentary about yoga would be like. After listening to lovely music from Steve and Anne-Emilie Gold, and meeting director Kate Churchill, we settled in for this journey. Kate’s purpose, we quickly learned, was to take Nick Rosen, a yoga novice, and expose him to different teachers and styles of yoga for three months and see if there was a transformation, or enlightenment. They spent time in the States and in India. They took yoga classes and had rare one-on-one meetings with teachers like BKS Iyengar and couple David Life and Sharon Gannon of Jivamukti Yoga. One of the teachers Kate and Nick visit is Sri K Pattabhi Jois, Guru of Ashtanga Vinyasa Yoga, who passed away on May 18 at his home in Mysore, India. Well you all should all see the film, so I won’t ruin it for you, but it confirmed to me what I have always loved about yoga: there are many different paths and many different ideas of what one is traveling towards. And this can be very confusing to one starting the path, especially if the one guiding yoga has an agenda (like making an interesting, inspiring movie). What I love about yoga is that the journey just keeps on getting richer the longer you travel it. It takes longer than three months to “get” yoga. At the end of the film, Kate held a Q & A and said that Nick was still practicing. That, I think, makes her efforts a success. Did you see the movie? What did you think? P.S. Another documentary worth checking out is “By Invitation Only”, by my very own sister, Rebecca Snedeker! You can now see the opening footage on her website: www.byinvitationonlythefilm.com. You’ll also get a great idea of what a Mardi Gras parade is like.